Cand imi aduc aminte de mine, adolescenta de 15 ani, ma si vad in timpul orelor de practica (deh, eram pe vremuri comuniste cand toti trebuia sa fim oameni ai muncii) schimband cu colegii casete cu Michael Jackson. Adevarul e ca pe vremea aia cine avea asa ceva era cea mai populara persoana din liceu :). Am ascultat albumul Thriller de atatea ori si atat de tare, incat parintii mi-au ascuns casetofonul. Cu alte cuvinte, adolescenta si tineretea mi le-am umplut cu melodiile lui. Nici pana acum nu-mi vine sa cred ca a murit. Si nici ca a trecut deja un an! Am facut aceasta prajitura inspirata de melodia lui, Black or White. Prajitura” Negri in camasi albe” o stiu de la mama, de cand eram mica. Mi se pare o prajitura de sarbatoare, care arata deosebit de frumos pe masa incarcata cu bubatati. Este foarte gustoasa si place oricui. Incalzeste cuptorul la 180C si pregateste o tava de dimensiuni maxim 40 cm x 40 cm. ( Daca tava e mai mare, blatul iese prea subtire.) Unge-o cu unt si tapeteaz-o cu faina. Lasa la racit blatul cu bezeaua. La baia de aburi amesteca zaharul, galbenusurile si cacao pana ce crema se intareste. Lasa la racit si pune untul. Unge bezeaua cu crema. Da la rece ca sa se intareasca bine. Taie cu un cutit ascutit, tinut in apa fierbinte. I can not believe that one year passed already. And I still can not believe that he is dead. I remember me, in early 80’s, a teenager listening to songs from Thriller so many times and so loud, that my parents hide my cassette player. Memories.. I actually grew up with his songs. So, this cake is my tribute to you, Michael Jackson. Inspired from the song Black or White. I will always remember you. It starts with the bottom layer: Preheat oven to 180C and prepare a tray maximum size 40 cm x 40 cm. If pan is bigger, the layer is too thin. Brush it with butter and coat it with flour. Beat well egg whites until hard. Mix egg yolks with sugar until they turn white. Add in yolks flour, cocoa, baking powder (sifted in advance). stir well. Add the egg whites slightly. Pour into shape and bake 15 minutes, until dough is half done. Put meringue and cook 15 more minutes. Meringue: Hard beat egg whites, then add a teaspoon of sugar at a time, beating well after each addition. Take the cake out of the oven and allow to cool. Cream:Melt in a double boiler (over steam), sugar, yolks and cocoa until the cream hardens. Allow to cool and mix butter in it. Spread over meringue. Leave overnight in refrigerator. mmmmmm,imi vine sa pap monitorul de pofta! cu mare drag, giovanna. Te pup. @TheChocolatePriestess: I didn’t try to store the cake because when I make it, it evaporates very fast :), Last time I saved a piece for my mom and it was very good after 3 days. Meringue was ok. Your cake is so decadent and delicious looking. Yummy! That looks like a lovely cake. How long with the meringue part store after you make it? How quickly should such a cake be eaten? Beautiful cakes and a lovely tribute. O prajitura gustoasa ca tribut pentru un om care ne-a schimbat viziunea asupra lumii pentru totdeauna. Imi place mult ideea! Great tribute:) And what a lovely cake! Lovely idea for an MJ tribute. I have one going on Facebook, too, for favorite songs. Nice pic! very nice tribute indeed!! 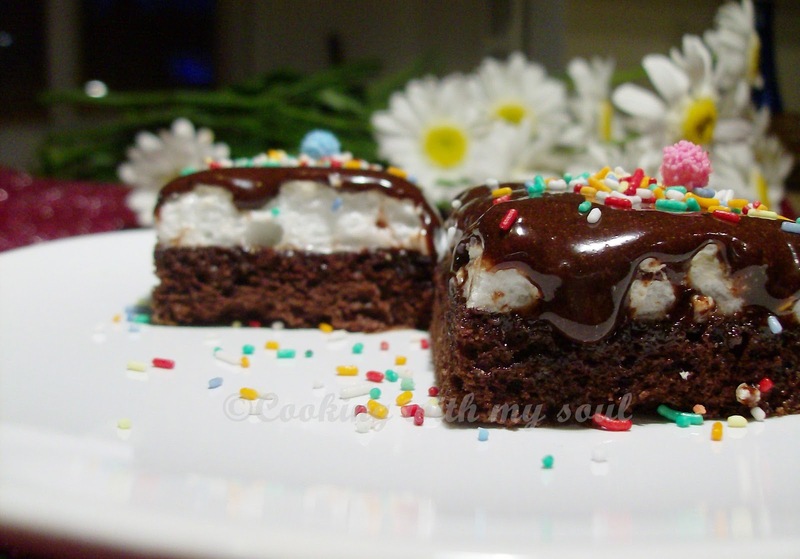 What a great combination of flavours….the meringue and that ooey gooey chocolate topping!